Taking your phone charger on the go is a hassle, and cables are a tangled mess. 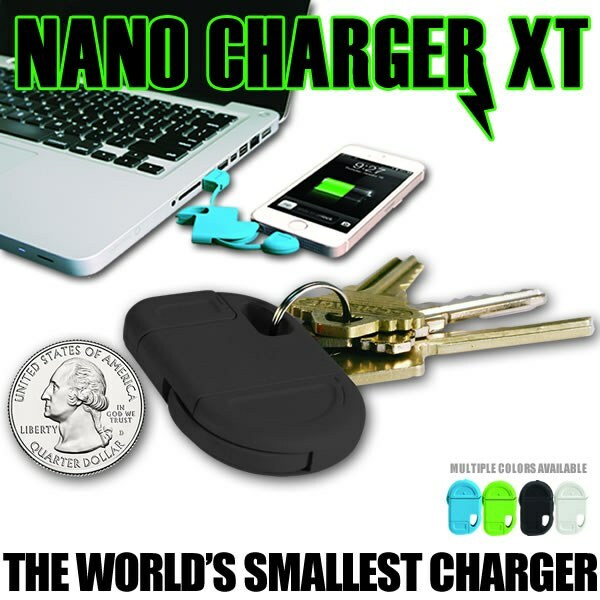 The Nano Charger XT is a compact, portable power cord that fits on your keychain so it&apos;s always with you. Nano Charger XT is about the size of two quarters, and lets you break free by connecting to any USB power source. Charge your phone at work, at school, or even in the car. The Nano Charger XT&apos;s flip-out/flip-in design protects your connections when not in use - no more busted cords! Available for iPhone, Android, Windows Phone, tablet, iPad, or any device with a micro USB or Lightning Port. Select the type you need and buy the Nano Charger XT today! These are so handy! They work very well too. Nice to keep on a Keychain that way you always have it while on the go. Just the right thing as it makes it easy if you have different things to charge. Keep up the good work! Love the pocket size but not always near a usb port to plug in to. 34 people found this helpful. Was this review helpful? Gave one to wife and one to my daughter. We all use and love them. It&apos;s very convenient. Just put it on ur keychain an go. The only bad thing is that it doesn&apos;t fit my current phone. But I go thru phones so fast that I&apos;m sure it&apos;ll come n handy. Cute little charger! No long cable cords which are hard to hide. Just connect to battery pack, almost invisible because so small. Yes I would recommend to my friends. works fine but cord is too short . another can be plugged into it if needed though. I do like that it fits in my purse pocket so well. Very small and not easy to use if you have big hands the way to pull it apart to charge then put away but it does charge and is why I gave it 3 stars. Absolutely love this product. It wil charge my phone faster than a regular charger! Awesome product. I don&apos;t have to remember to pack the phone charger when going to work or to travel. I love the Nano Charger XT!!! It is so small that I just put it on my keyring and I know wherever I go, I will have a way to charge my cell phone!! Love this product!!! I bought one for myself, my husband and all our kids!! We all love the Nano Charger XT!!! too short. Where do I put phone? It will hang in car from usb port. Was afraid of it at first going off accidentally but no problem. It&apos;s a tiny thing that&apos;s handy for travel. Works OK so far. Extremely convenient i absolutely love my nano chargers. The only thing i would change would be the length of the chord its almost too short to use. It works fast and is portable. Very helpful to have when you&apos;re not near electrical outlets. My charger has helped me out of a few jams already. A piece of cake to store or just clip on your keyring to always have it handy. I love this small charger! It is really compact.